L'Eau d'Issey Pour Homme by Issey Miyake is a fresh, aromatic and woody fragrance for men. This vibrant and innovative scent has earned a large following since its launch and its success can be attributed to its timeless freshness and decisive character. The fragrance opens with top notes of fresh citrus with yuzu fruit taking the lead alongside spicy coriander, tarragon and sage. Middle notes are well balanced in a spicy blend of nutmeg, Ceylon cinnamon, saffron, Bourbon geranium, mignonette, blue lotus and lily of the valley on a vigorous base of tobacco, warm amber, aromatic woods, musk and exotic Tahitian vetiver. Issey Miyake is famous for choosing very unusual and rare materials to create original perfumes that evoke the sense of timeless freedom. The nose behind this fragrance is perfumer Jaques Cavallier who also created the original L'Eau d'Issey in 1994. 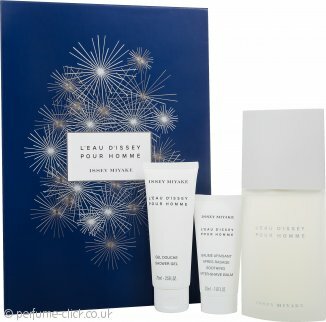 L'Eau d'Issey Pour Homme was launched in 2009. Very happy customer, deliverd on time and well packed! boyfriends Xmas pressie he was chuffed. This was a gift for my husband. I took a chance and ordered it solely off reviews on the internet and very glad I did. The scent is lovely, not overpowering and made the perfect gift. Great product and very good value. Bought for a present for my son and he is very pleased with it. Speedy delivery, Will purchase from this company again. This is a good price, it smells great and was bought for a christmas present for hubby, one if his favourites so I know he'll love it. Also quick delivery.